What the hell is domain authority anyway and why should we track it? I have asked people who know, I have thought I knew, and I have looked at it with my sonic screw driver in my hand (you’ve got to be in the right frame of mind, obviously) for a hell of a long time – but NEVER ONCE did I actually think to write it down…to note what it was at a particular given date. Domain authority – schmain authority…why should we care? How old you are; not as in whether you are 18, or 40, but what age the domain you have is – if you are six months old, in Domain Authority terms you are still in nappies and you won’t be hitting its heady heights just yet. A lot of these impact the nebulous toolbar Google Page Rank too; which some are suggesting may never be updated again. This, in turn, means that all of these things will help you to be seen more by people searching Google. If you are a parent blogger, like me, then your MozRank, with is based partly on your domain authority, also affects your Tots100 ranking as well. She says, hoping that this is still true, and she hasn’t killed any pixies by just mentioning it…. In addition, organisations sometimes use domain authority as a way to determine whether your site is trustworthy, and has a good reputation. If it is above specific values, it can affect whether brands, and PRs want to work with your organisation. I have always used link explorer (OSE) to check domain authority pretty regularly for free. My browser of choice is Chrome too, and so I have the Moz Chrome extension running which enables you to check Moz rankings in your browser while fiddling about on t’interweb. So last week when I looked at it and the domain authority for kiddycharts.com had fallen a massive FIVE when it had been steadily climbing for months, I asked other bloggers, and website owners if they had seen something similar, was there a domain authority change a foot? Many people wouldn’t have bothered, but I like numbers, me. I found out that other websites had seen significant domain authority changes too. Sites around my wee circle of friends and fellow bloggers suffered similar tumbles to me, and were just as confused. I was ashamed – I was a business analyst for christ sake – how could I possibly FORGET to write down some numbers. I LOVE numbers. What was I thinking of? Was there really anything happening with domain authority – who knows? However, I still wasn’t sure what was going on. I wasn’t doing anything different, so I tweeted the lovely people at Moz who do whizzy stuff with elves, fairies and other magical creatures to determine the Domain Authority metric and asked them;you can do the same too by emailing help@moz.com. @KiddyCharts We had an index update last week and many are reporting DA changes. c) There was an update to the index and perhaps that was what caused the drop – but five, well that just wasn’t fair, right? This is what Moz support told me after a couple of days of queries from me…. “We had our data engineers look into this, as it seemed to have caused this issue with a few customers. They’ve discovered that the increased size of the index [from an update on the 29th Oct] did have an unintended side effect for computing PA and DA. It doesn’t affect a large number of domains in the index, but some domains will see decreased numbers as a result. We’re working to correct it and hopefully this will be fixed by the next time an index goes live. Keep a record of your domain authority and your link profile – don’t get caught out like me…. Now, I have a spreadsheet, and I am not letting Moz and its pesky domain authority slip through these fingers again…. *bit late sunshine. * I advise you to do the same too, you never know when numbers and spreadsheets can come in handy. We can’t keep relying on nine-year olds and their memory now, can we? Because I am a nice lady – here is a template for the forthcoming year as well – now you don’t have any excuses to keep track now do you – five minute job once you have downloaded it, isn’t it? Are you a professional website owner or blogger? Do you track your SEO related statistics? If not, why not? You could save yourself a headache you know….as well as stop yourself from having to kick the nearest cat, or ask a nine-year old for help. Always something worth avoiding I can tell you. Hey, thank you very much for making it all simple. 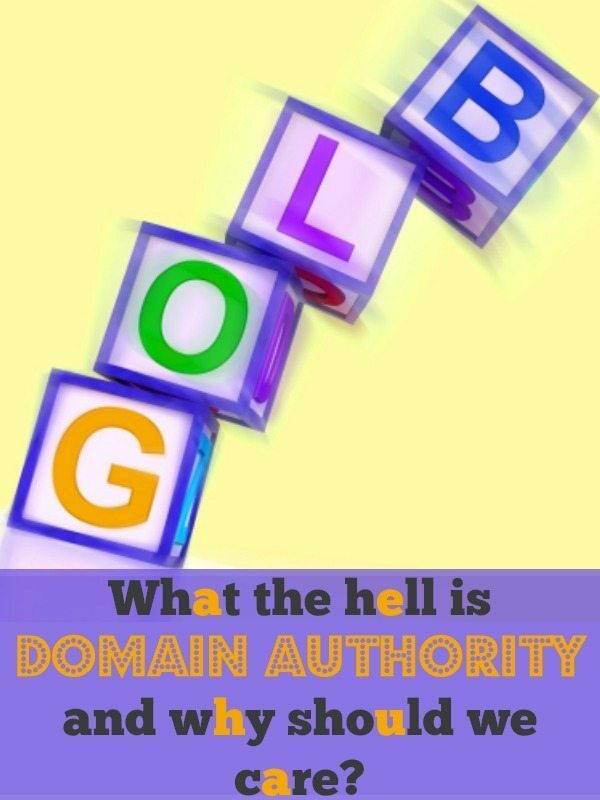 I was much confused about the term Domain Authority. I’ll pay attention towards my DA from now on. Thank you for the spreadsheet. thanks for the helpful information,it seems like doing great and on track on your blog, learn a lot from an expert blogger like yours, didn’t pay attention to da until just recently I have search how important to keep track on your stats, thanks. Wow a well detailed and interesting post. I learnt alot from this. A very interesting article and a very nice surprise (for me) that I ended up here. Domain Authority was something I hadn’t even considered, but is definitely something worth investigating as I love writing about some of the more obscure sides of running websites. Hope things sort themselves out for you. Thanx for the spread sheet..
I’ve heard a lot of people say theirs went down in this blip. Mine seemed to stay the same so no idea how when other similar blogs lost out. Maybe mine will flip when they do the update.